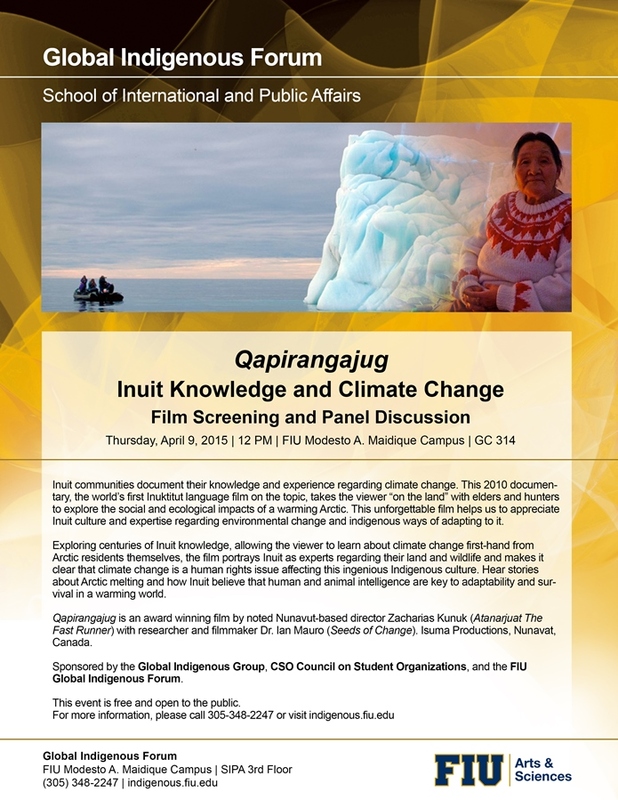 The Global Indigenous Group, a FIU student club, invites you to this 2010 documentary, the world’s first Inuktitut language film taking the viewer “on the land” with elders and hunters to explore the social and ecological impacts of a warming Arctic. Discussion following the film led by Dr. Jim Riach, FIU Department of Earth and Environment, will highlight the many issues that affect every one of us. This unforgettable film helps us to appreciate Inuit culture and expertise regarding environmental change and indigenous ways of adapting to it. Award winning film by noted Nunavut-based director Zacharias Kunuk (Atanarjuat The Fast Runner) with researcher and filmmaker Dr. Ian Mauro (Seeds of Change). Isuma Productions, Nunavat, Canada. Sponsored by the Global Indigenous Group, CSO Council on Student Organizations, and the FIU Global Indigenous Forum.